A Pack Of 50 x single wall 'Maximum large letter size' postal mailing cardboard boxes, specifically manufactured to meet the MAXIMUM size allowed under Royal Mail 'large letter' guidelines, leading to heavily reduced postage costs. 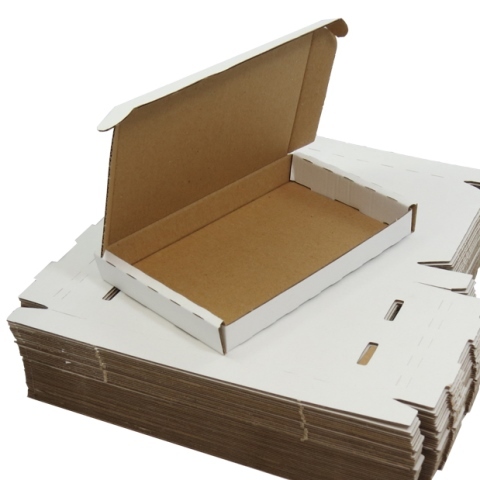 These boxes are specially designed with fold over ends and earlock lids, making them easy to construct and self-folding. They are designed to fit items that will go as a 'large letter' with royal mail, saving on postage costs and ensuring the item stays in one piece in a secure box, and does not move out of proportion. These are an excellent solution for individuals or businesses looking to save money on postage, while offering a good presentable solution to their customers. Manufactured specifically to send accessories and low depth items such as ipads and tablets in the post, while keeping postage costs as low as possible.